Home / Blog / Landscape Design Advice / What do I do with all this brown, dead stuff? We’ve designed and planted perennial gardens in which we cut back every single stalk of dead vegetation in November or December, and then cover the planting beds with a layer of black, spicy-scented leaf mulch. It’s quite a sight: crisp bed edges dividing expanses of uniform lawn (still green) from the dark mulch carpet. Nice, neat, tidy, and clean. When the first light snow falls it sticks to the grass but melts on the mulch. The planting beds appear jet black against the snowy lawn. 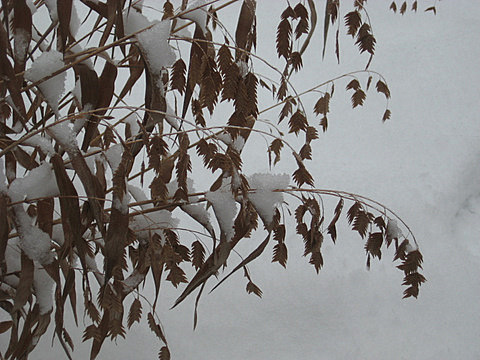 My backyard, on the other hand, is a jumble of coneflower and Joe Pye weed stems, buckling under the weight of snow. Shasta daisy and anemone stalks are gates for the dog’s tamped down slalom course. I can take a break from shoveling to poke around and find miniature forest scenes poking up through the snow. Which approach is correct, tidy or wild? Horticulturally, it doesn’t matter much, although I think (but can’t prove) that all those leaves and stems provide some protection from the winter elements. And, even if you are the neat-garden type, I would recommend leaving anything that is still green when you are doing your fall garden clean-up. It’s quite amazing the number of plants that have green tufts of foliage at ground level that remain throughout winter. Although I personally leave the perennial beds untouched until spring, I make some exceptions. 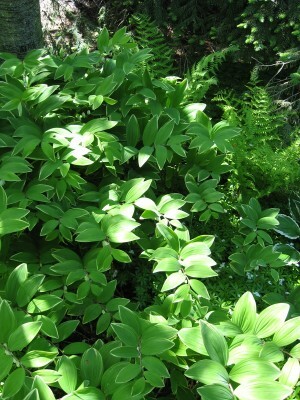 For instance, I will remove dead foliage to control a persistent insect or disease problem. Bugs and fungi overwinter on dead stems and foliage. (Of course, beneficial insects and fungi overwinter in the same places.) In all the landscapes we care for, regardless of a client’s personal preference for tidiness/untidiness, we remove all peony foliage after it dies in autumn – and that includes any foliage on the ground. This helps control the dreaded botrytis blight. Another exception would be to cut down foliage that will fall over sidewalks and driveways. Those things can stop a snow blower dead in its tracks.